In the mid-1980s, Nigel Smith was a graduate student at Leeds University. He was interested in the mysterious origins of cosmic rays, bursts of radiation that collide with our atmosphere and produce showers of high-energy particles. He was settling in to work toward his doctorate degree running an array of cosmic-ray detectors with his advisor in nearby West Yorkshire, England. And then the South Pole called. His adviser decided to partner with a pair of American physicists to build another array in Antarctica, where higher ground and a constant view of the Milky Way galactic center made for better observing. The collaboration needed someone on location to operate the detector, and Smith leapt at the opportunity. He stayed at the South Pole the months between Valentine’s Day and Halloween—what’s called “wintering over”—collecting the data that would earn him his PhD. While Smith’s specific experience was unique, it demonstrates many of the general themes reported in a recent Symmetry survey about the experience of getting a PhD in particle physics or astrophysics. To get his degree, he had to work hard, collaborate with other people, adapt to new situations, and pick up unexpected skills. Nearly 2000 people worldwide complete the scientific rite of passage of earning a physics PhD each year. 1 APS Physics: Physics Doctoral Degrees by Citizenship Yet for many people, particularly those outside of science, the process remains mysterious. “I don't think most people even have a conception, much less a misconception” about earning a physics PhD, wrote survey respondent Charlie Cosse. The more than 300 responses to Symmetry’s survey described a challenging, multifaceted experience that goes far beyond job training, and even beyond the scientific goal of studying the fundamental nature of the universe. Many survey respondents felt that stereotypes about the field—particularly the idea of it being filled with Big Bang Theory-style science nerds—didn’t accurately reflect their experiences. In fact, many survey takers said they would like to retire the notion that people who study physics are inherently smarter than others—a stereotype that can intimidate current and would-be physics students. In reality, they said, success depends more on hard work and passion for the subject. Motivation can be key to getting through a degree process that, in many countries, usually takes at least five years. In the United States, doctoral students spend their first couple of years taking classes before going on to conduct research and write a dissertation. According to Symmetry’s survey results, day-to-day life generally includes programming, data analysis and experimental work, combined with teaching, writing and meetings—particularly for people who work on large collaborations. One thing essentially all respondents agreed on: It is a lot of hard work. Tognini started his graduate work in 2010, directly after earning his undergraduate degree, and defended his dissertation in 2018. In Brazil, the federal government provides funds for doctoral degrees, which must be paid back if the student doesn’t graduate, adding extra pressure to finish the program. Tognini worked for seven years without taking an extended vacation, which he says made the process particularly stressful. Different countries have different requirements and processes; in the UK, for example, students don’t start with classes, shortening the PhD process by several years. Nearly all survey respondents agreed that the experience of earning a PhD is mentally taxing and that finding support among fellow students is a key to success. Pachal is in her second postdoctoral appointment, a temporary academic or research position for PhD graduates. 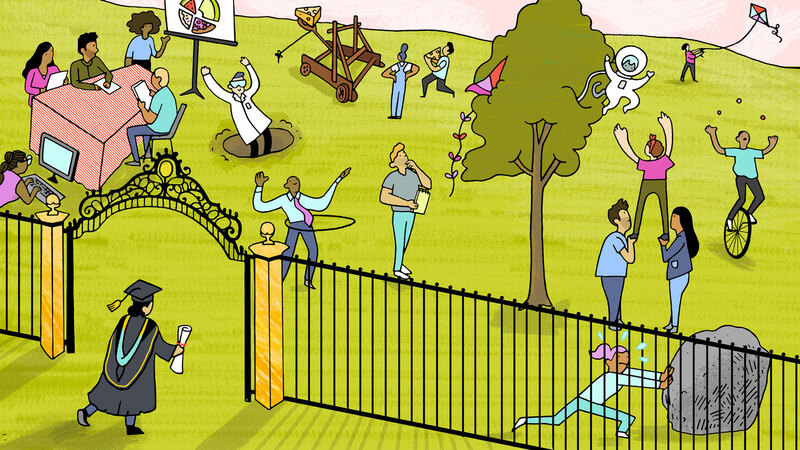 With its large experimental collaborations, particle physics in particular relies on a high number of postdoctoral researchers—often called postdocs—to do the day-to-day work needed to keep experiments operating. But permanent positions as researchers or tenured professors are rare. For example, CERN Director-General Fabiola Gianotti mentioned at a recent talk that 90 percent of students who earn their PhDs at CERN don’t go on to work in physics. That leads to another common, if paradoxical, piece of advice from Symmetry’s survey: Don’t get a physics PhD because you want to be a physicist; get a physics PhD because you want the experience of earning a physics PhD. “Very few people become professors, and it is a very long and arduous path even if you are one of those people,” Pachal says. “So if you don’t enjoy the path, there’s a very good chance you’re just having a few years of no fun at all for no reason. Recent graduate Daniel Klein, who completed his PhD in 2018 at the University of California, San Diego working on CERN’s CMS experiment, says he’s found that much of the work he did processing large datasets for CMS is directly applicable to data science. He’s currently a fellow with Insight, a for-profit company that provides training, mentoring and industry connections for doctoral graduates seeking to enter the data science field. About one-fifth of the survey’s respondents were not working in physics. Although many of that group worked in data or finance, they also included teachers, a US Navy researcher, an artist, a literary agent and an orchestra manager. “The breadth of skills you can pick up with a well-placed PhD in physics is quite extraordinary,” Smith says. Not all respondents agreed that their degree prepared them well for life after physics, and some noted that those skills could also be obtained more easily—and more cheaply—with an undergraduate or master’s degree or other training. It’s clear a physics PhD is not something to be undertaken lightly, and most respondents suggested speaking with others in the field and thinking through career options before making a final decision. For nearly everyone who answered, earning a doctoral degree in physics was a unique experience that provided them the opportunity to work with people from all over the globe while attempting to answer some of the universe’s most challenging questions.